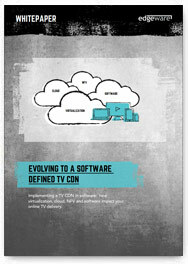 How does virtualization, cloud, NFV and software impact your online TV delivery and what is the ideal evolution path from an appliance based solution to a pure software solution? To build an optimized TV CDN for your TV content, you will almost certainly take advantage of cloud, virtualization and software solutions. But to migrate to a pure software defined TV CDN, at high volumes and across real networks, it is essential to understand the physical reality that underpins each of them. You need to consider all the different TV CDN functions you will need, from request routing to streaming, and pick the best platform appropriately. So, what is the ideal evolution path from an appliance based solution to a pure software solution? We need to take advantage of the flexibility, agility and openness of software solutions without compromising on quality or cost, and importantly there must be a seamless migration path from start to end that is not service affecting.